Majorities of Americans say the federal government is doing too little to protect key aspects of the environment including water (69%) and air quality (64%). And two-thirds of Americans (67%) say the government is doing too little to reduce the effects of climate change. These findings come after a year of change in climate and energy regulatory policies under the Trump administration. At the same time, Americans are closely divided (52% to 48%) over whether or not it is possible to cut back on regulations while still effectively protecting air and water quality. There are wide political divides on this issue, with roughly three-quarters of Republicans (74%, including independents who lean Republican) convinced this is possible but 64% of Democrats (including Democratic-leaning independents) convinced it is not possible. 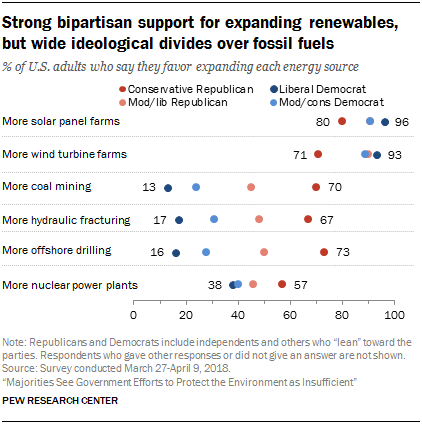 The national survey by Pew Research Center, conducted March 27-April 9 among 2,541 adults, finds pockets of partisan agreement over expanding solar and wind power, though wide political divides remain over increasing fossil fuels through such methods as coal mining, hydraulic fracturing and offshore drilling for oil and natural gas, a pattern consistent with a 2016 Pew Research Center survey. Further, a majority of Americans support a range of energy policy priorities including protecting the environment from the effects of energy development and use (72%) and increasing reliance on renewable energy sources (71%), as well as reducing dependence on foreign energy sources (69%) and keeping consumer energy costs low (66%). More Democrats and Democratic-leaning independents give priority to protecting the environment as well as increasing reliance on renewable energy sources; a larger share of Republicans and independents who lean to the GOP put priority on reducing U.S. dependence on foreign energy sources. 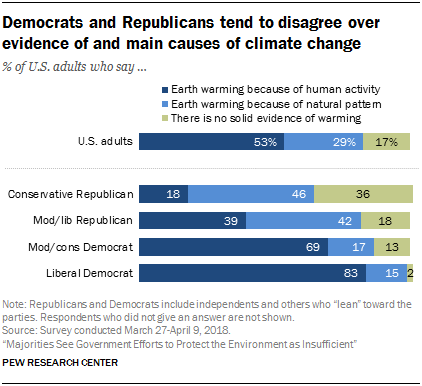 Consistent with past studies, Republicans and Democrats remain divided over whether the Earth is warming and the importance of human activity in the process. The new survey finds three-quarters of Democrats and Democratic leaners believe the Earth is warming primarily due to human causes, compared with 26% among their Republican counterparts. Similarly, Democrats are much more likely than are Republicans to express concern about the issue of climate change and to see at least some effects of global warming in their local community or in their own lives. There are wide political divides over the consequences of policies aimed at climate change that hold even among those who agree that the Earth has been warming. Most Republicans are skeptical about whether, in general, policies aimed at reducing climate change benefit the environment (72% of Republicans and Republican leaners say these policies either make no difference or do more harm than good), and 57% think such policies harm the economy. For their part, about two-thirds of Democrats (66%, including leaners) think that such policies will help the environment and most see either no harm (39%) or net benefits for the economy (45%) from such policies. 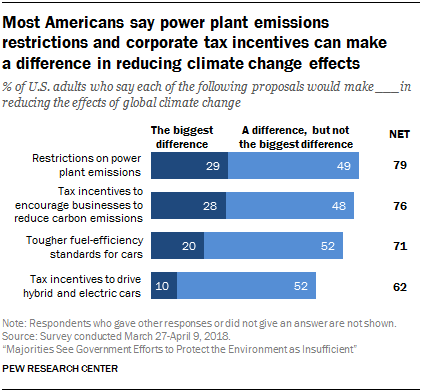 When asked about specific proposals to reduce climate change, most Democrats (90%) and smaller majorities of Republicans (65%) say that restrictions on power plant emissions would make a difference in reducing climate change, as would tax incentives encouraging businesses to reduce their carbon emissions (85% and 65%, respectively). Republicans, particularly conservative Republicans, are less convinced that tougher fuel efficiency standards for vehicles or tax incentives to encourage more individuals to drive hybrid and electric cars will make a difference in reducing climate change. Opinion about one new approach on the horizon – solar geoengineering, which seeks to lower the Earth’s temperature through broad-based changes to the atmosphere – divides strongly along political lines. 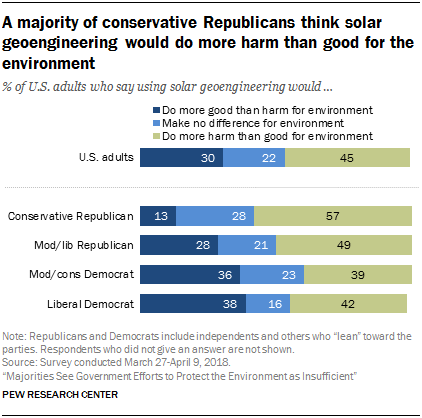 About eight-in-ten conservative Republicans (78%) say solar geoengineering would not make a difference in reducing climate change while 64% of liberal Democrats say it would. 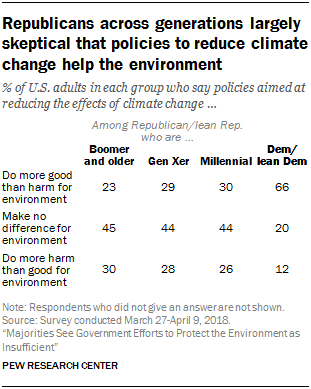 Four-in-ten Democrats (40%) and about half of Republicans (54%) express concern that such approaches would do more harm than good for the environment, however. Generational differences emerge on some energy and climate issues, but such differences occur primarily among Republicans, not Democrats. Republican Millennials are less inclined than their elders in the GOP to support increased use of fossil fuel energy sources through such methods as offshore drilling, hydraulic fracturing and coal mining. For example, 75% of Republicans in the Baby Boomer and older generations support the increased use of offshore drilling, compared with 44% of Millennial Republicans. Among Democrats, there are no more than modest differences by generation on beliefs about these climate and energy issues. During the first year of the Trump administration, the Environmental Protection Agency has rolled back more than 30 environmental regulations, and it recently announced a plan to lower carbon emissions standards on automobiles. Amid these changes, Americans are divided on whether it is possible to cut regulations while still effectively protecting air and water quality, with 52% saying it is possible and 48% saying it is not. 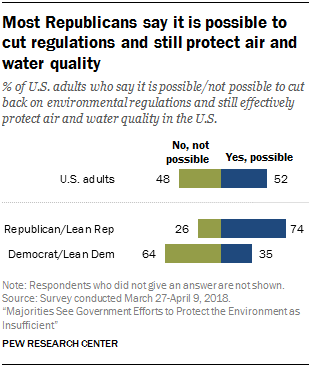 Some 74% of Republicans and independents who lean Republican believe it is possible to cut regulations and protect the quality of air and water, compared with 35% of Democrats and Democratic leaners who say the same. 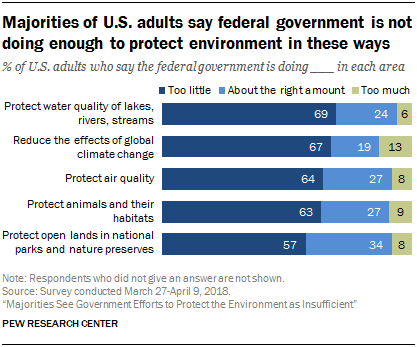 More specifically, majorities of Americans say the federal government is doing too little to protect water quality (69%), air quality (64%), animals and their habitats (63%) or open lands in national parks (57%). Also, two-thirds of U.S. adults (67%) say the government is not doing enough to reduce the effects of global climate change. Only about one-in-five Americans (19%) say government officials are doing “about the right amount” to deal with climate change, with another 13% saying “too much” is being done. Political leanings have a profound influence on how Americans view government activity. 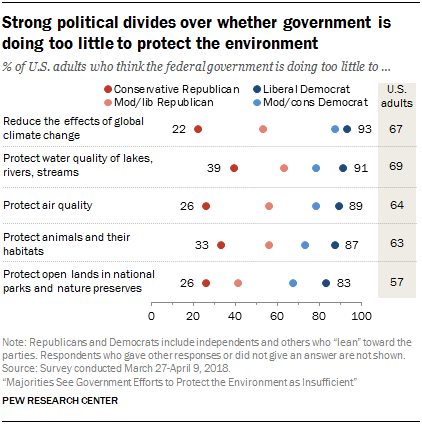 Roughly nine-in-ten liberal Democrats believe the federal government is not doing enough to protect key aspects of the environment such as air (89%) and water quality (91%). By contrast, minorities of conservative Republicans believe the government is doing too little in these areas. For instance, 89% of liberal Democrats say the federal government isn’t doing enough to protect air quality, compared with just 26% of conservative Republicans who say the same. When it comes to water quality of lakes, rivers and streams, 91% of Democrats say the federal government isn’t doing enough, compared with 39% of conservative Republicans. Conservative Republicans – about half of them – say the government is doing “about the right amount” to safeguard these aspects of the environment. 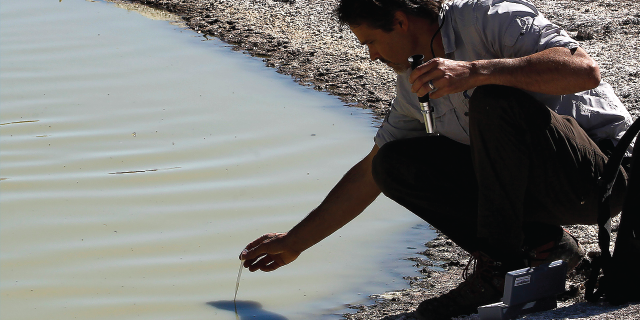 A smaller share says the government is “doing too much” to protect air (18%) or water quality (14%). Moderate or liberal Republicans are more likely than their conservative counterparts to say that the federal government’s environmental efforts are insufficient. For instance, 63% of moderate or liberal Republicans believe the government is doing too little to protect the water quality of lakes, rivers and streams, compared with 39% of conservative Republicans who say the same. Separate Pew Research Center surveys found a 15-percentage-point decline between 2015 and 2017 in Americans’ overall ratings of how well the federal government is protecting the environment. Views of government performance in this area shifted among both Republicans and Democrats. Strong majorities of Americans believe the top priorities for U.S. energy policy should be protecting the environment from energy development and use (72%), increasing reliance on renewable energy sources (71%) or reducing U.S. dependence on foreign energy sources (69%). Majorities of Americans also say that keeping energy prices low (66%) or creating jobs within the energy sector (58%) should be top priorities. As is often the case with issues related to energy and the environment, there is a partisan divide over how best to prioritize U.S. energy goals. Strong majorities of Democrats and Democratic-leaning independents believe the top priorities should be protecting the environment from the effects of energy development and use (83%) or increasing America’s reliance on renewable energy sources (80%), compared with 56% of Republicans and Republican leaners who say the same about protecting the environment from the effects of energy development and 59% who would prioritize renewable energy sources. 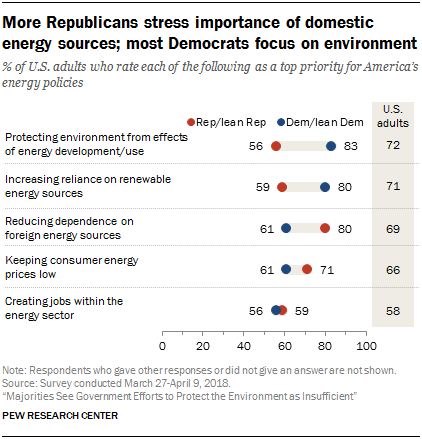 Eight-in-ten (80%) Republicans and Republican leaners believe a top objective of U.S. energy policy should be reducing dependence on foreign energy sources – a view shared by 61% of Democrats and Democratic-leaning independents. The two parties tend to agree on the relative importance of economic issues when considering energy policies, with 56% of Democrats and 59% and Republicans saying that creating jobs within the energy sector should be a top priority, and 61% and 71%, respectively, saying the U.S. should focus most on keeping consumer energy prices low. Liberal Democrats are less likely to give top priority to maintaining low energy prices (49%) than moderate or conservative Democrats (72%). The views of moderate or conservative Democrats are nearly the same on this issue as moderate or liberal Republicans (69%) and conservative Republicans (72%). Around three-fourths of Americans (76%) are aware that U.S. energy production has increased over the past 20 years. 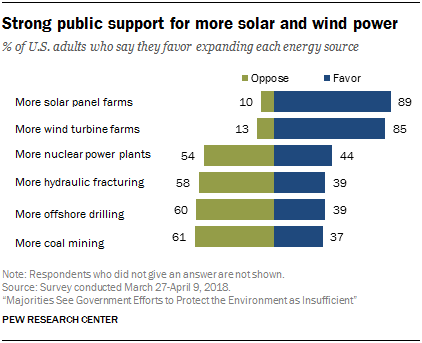 And large majorities of Americans favor expanding at least two types of renewable sources to provide energy: solar panel (89%) and wind turbine (85%) facilities. Fewer than half of Americans support more hydraulic fracturing or “fracking” (39%), offshore oil and gas drilling (39%) or coal mining (37%); 44% support more nuclear power plants. These figures are in keeping with the findings of a 2016 Pew Research Center survey. Robust support for expanding solar and wind power represents a rare point of bipartisan consensus in how the U.S. views energy policies. 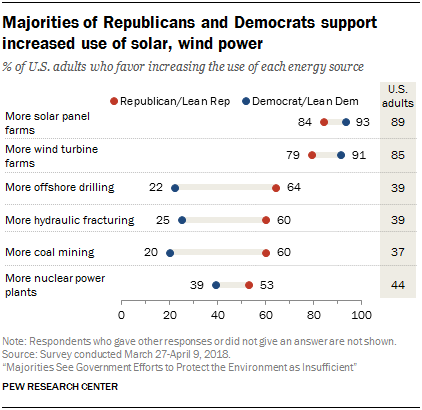 Both conservative Republicans and liberal Democrats, for instance, strongly favor the expansion of solar panel farms (80% and 96%, respectively) and wind turbine farms (71% and 93%, respectively). However, the political gap over fossil fuels remains vast, with 73% of conservative Republicans and 16% of liberal Democrats favoring more offshore drilling; 70% and 13%, respectively, supporting more coal mining; and 67% and 17%, respectively, in favor of expanded fracking. Moderate or liberal Republicans tend to be more divided than their conservative counterparts over fossil fuels. For example, 49% of this group favors more offshore drilling for oil and natural gas, while 50% oppose it. The political divide over nuclear energy, a carbon-neutral technology, is less pronounced than it is over fossil fuels: 57% of conservative Republicans support the expansion of nuclear power plants versus 38% of liberal Democrats. In keeping with previous Pew Research Center surveys, women tend to be less supportive of expanding nuclear power than men, even after controlling for political party. Some 35% of women favor and 63% oppose more nuclear power plants. Men are more closely divided on this issue: 53% favor and 46% oppose. Political divides over expanding the use of offshore drilling, hydraulic fracturing and nuclear power are consistent with past Pew Research Center surveys using somewhat different question wording and polling methods. See the Appendix. While there is wide support for the expansion of solar and wind power, Americans are divided over the most effective way to promote wider adoption of renewable energy sources. Views on this question are strongly aligned with partisan affiliation. 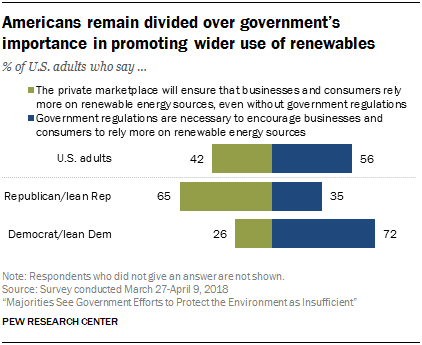 While 72% of Democrats and Democratic-leaning independents say that government regulations are necessary to promote adoption of renewable energy sources, 65% of Republicans and Republican leaners say the private marketplace can accomplish that goal without government regulations. These findings are in keeping with a 2017 Pew Research Center report, which used slightly different question wording and methods. 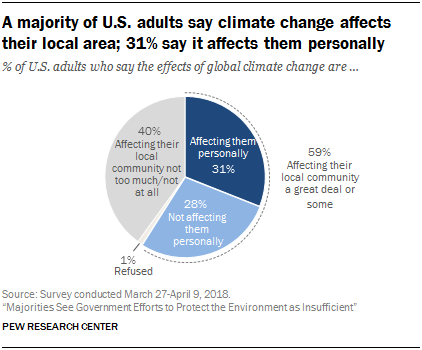 Three-quarters of Americans believe global climate change has at least some effect on the U.S. today, and about six-in-ten (59%) believe climate change has at least some effect on their local community, the new survey finds. On balance, most Americans believe it is possible to reduce the effects of climate change, and about half say that policy efforts to diminish those effects have a net benefit for the environment. However, views on how such policies impact the economy are mixed, with roughly even shares saying these policies have a net positive, net negative and no effect on the economy. There are wide partisan differences on climate issues, as has been found in more than a decade of surveys. Political divides are found in issues ranging from what drives climate change to how policies aimed at climate change reduction will affect the environment and the economy. Some 53% of Americans say the Earth is getting warmer mostly because of human activity such as burning fossil fuels; roughly three-in-ten (29%) say the Earth is getting warmer mostly because of natural patterns in the Earth’s environment and another 17% say there is no solid evidence of warming. The share of adults saying human activity is the primary cause of climate change is similar to a 2016 Pew Research Center survey, in which 48% of Americans said that the Earth is warming mostly due to human activity. 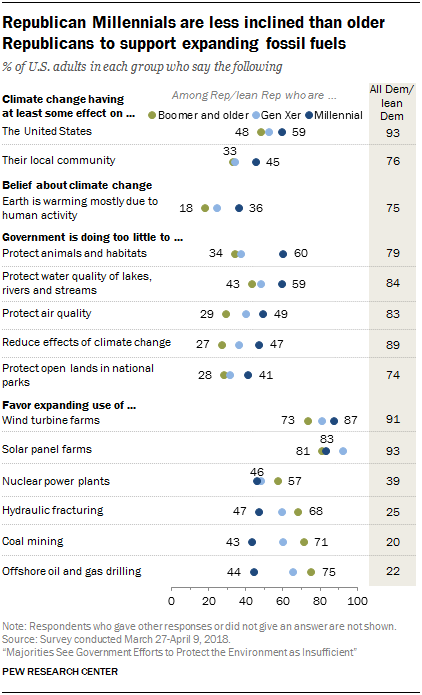 There are wide differences in beliefs about climate change by politics. About eight-in-ten liberal Democrats (83%) say the Earth is getting warmer mostly because of human activity. In contrast, 18% of conservative Republicans say this, a difference of 65 percentage points. Some 46% of conservative Republicans say the Earth is getting warmer mostly because of natural patterns and 36% say there is no solid evidence of warming. While previous Pew Research Center surveys have asked about this issue using somewhat different question wording and polling methods over time, surveys since 2006 have found wide political differences in public views about climate change and the role of human activity. See the Appendix. 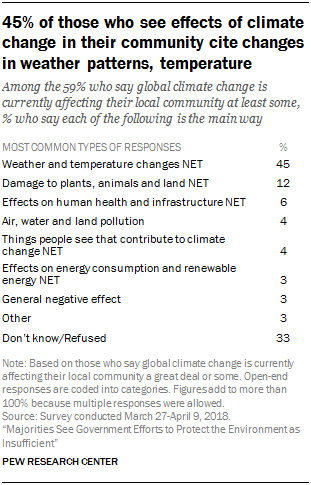 Americans were also asked what they understand to be the view of most climate scientists on climate change. Two-thirds of adults think most climate scientists say the Earth is getting warmer mostly because of human activity, while much smaller shares think most climate scientists point to natural causes to explain the Earth getting warmer (17%) or say there is no solid evidence the Earth is warming (16%). 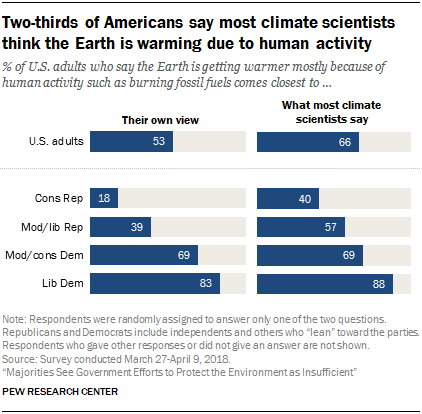 People’s political orientations are strongly related to their perception of the scientific consensus on climate change.4 In this survey, a strong majority of liberal Democrats (88%) say most climate scientists think the Earth is warming due to human activity. By comparison, 40% of conservative Republicans say most climate scientists think the Earth is warming due to human activity. Among conservative Republicans, 40% say most climate scientists think human behavior is the primary cause of climate change, but just half that share (18%) hold this as their personal belief on climate change. Roughly three-quarters of Americans (76%) say climate change is currently affecting the U.S. either a great deal (40%) or some (35%). And roughly six-in-ten (59%) think climate change is affecting their local community either a great deal (22%) or some (37%). Those who perceived at least some effect of climate change in their local community were asked to consider if climate change has had a personal impact in their lives. Overall, about three-in-ten U.S. adults (31%) say the local effects are directly affecting their personal lives. Respondents who said climate change has affected their community were then asked how they felt their local area was affected. They were particularly likely to mention changes in the weather, including increasing frequency of severe storms, droughts, floods and wildfires (45% of those asked). Other responses to this open-ended question included damage to plants, animals and the landscape (12% of those asked) and effects on human health and local infrastructure (6% of those asked). Among the general public, perceptions of whether and how much climate change is affecting their local community are tied to political party and ideology. For example, 83% of liberal Democrats say climate change is affecting their local community at least some and almost half (48%) say the effects of climate change are impacting them personally. 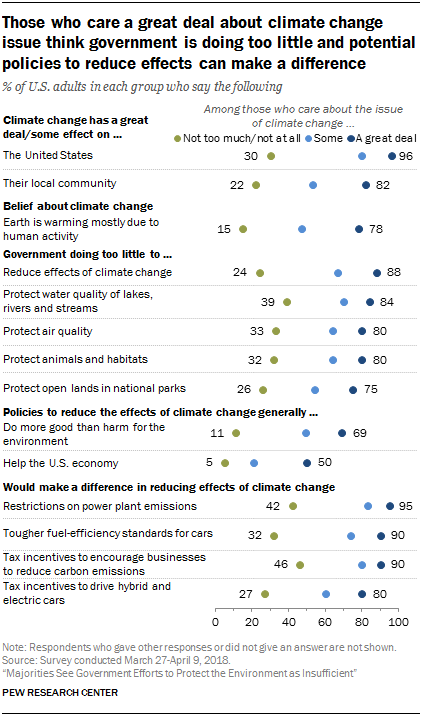 By contrast, about one-quarter (27%) of conservative Republicans say climate change is affecting their local community and 13% say climate change is impacting them personally. Even among those who say the Earth is warming, Republicans are less inclined than Democrats to see climate change affecting their local community. When it comes to policies aimed at reducing the effects of global climate change, about half of U.S. adults (49%) believe these policies have net benefits for the environment. Three-in-ten say these policies make no difference for the environment and about two-in-ten (19%) believe these policies end up doing more harm than good for the environment. As with other climate issues, there are sizable political divides over the effects of climate policies. 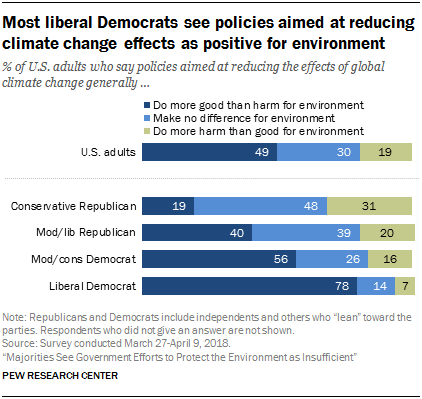 About eight-in-ten liberal Democrats (78%) say climate change policies do more good than harm, compared with 56% of moderate or conservative Democrats. Republicans are more inclined to believe such policies have little impact or bring net harm to the environment. 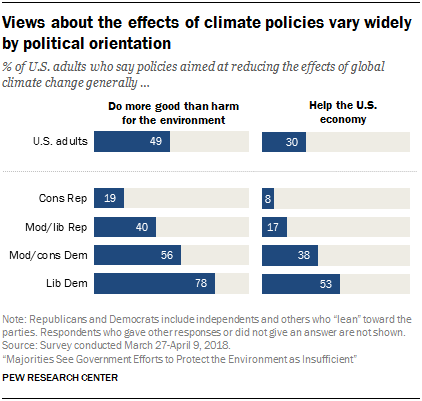 Among conservative Republicans, about half (48%) say these policies make no difference and three-in-ten (31%) say these policies do more harm than good for the environment. Americans tend to be more skeptical of what effects climate change policies have on the economy. Some 30% of Americans say climate change policies help the U.S. economy, while a roughly equal share (31%) believes these policies generally hurt the economy. Another 36% say policies to reduce the effects of global climate change generally make no difference to the U.S. economy. Conservative Republicans and liberal Democrats are at odds on this question. A majority of conservative Republicans (66%) say these policies generally hurt the U.S. economy, compared with just one-in-ten liberal Democrats (11%). 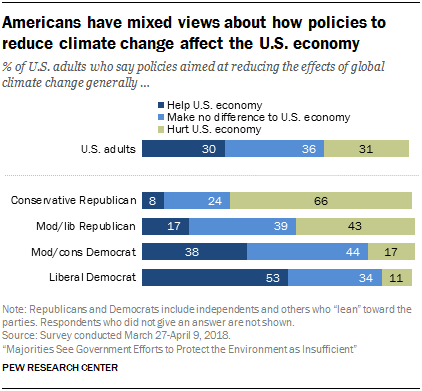 And while about half of liberal Democrats (53%) say climate change policies help the economy, only 8% of conservative Republicans say the same. Most Americans (68%) are generally optimistic that it is possible to reduce the effects of climate change, while 31% say otherwise. And majorities of Americans believe each of the four policy proposals considered in this survey would make a difference in reducing the effects of climate change. For instance, 79% of Americans say that restrictions on power plant emissions can make a difference in reducing the effects of global climate change. Three-quarters of U.S. adults (76%) say corporate tax incentives to encourage carbon emission reductions among businesses can make a difference, and roughly seven-in-ten (71%) say the same about tougher fuel efficiency standards for cars and trucks. Americans are somewhat less optimistic about tax incentives to encourage more people to drive hybrid and electric cars. About six-in-ten (62%) think this would make a difference in reducing the effects of global climate change. Conservative Republicans are less likely than other political groups to think each of these proposals can make a difference in reducing the effects of climate change. 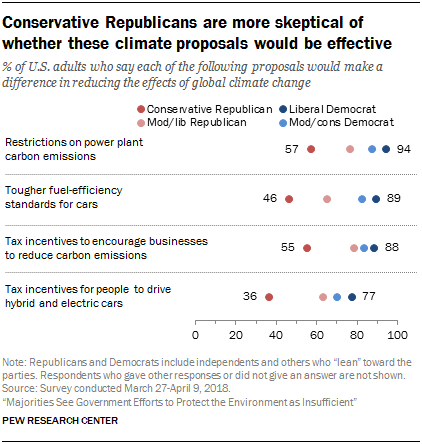 For example, 36% of conservative Republicans say tax incentives for people to drive hybrid and electric cars would impact climate change. By comparison, a majority of moderate or liberal Republicans (63%) and 73% of Democrats say this proposal would make a difference. Those who think climate change is the result of human activity or that it is possible to reduce the effects of climate change are also particularly likely to say each of these specific proposals can make a difference. Researchers and policymakers are also considering the possibility of altering aspects of the environment to reduce the effects of climate change, a technique called geoengineering. Solar geoengineering, for instance, would spread particles in the atmosphere to reflect some incoming sunlight, decreasing the amount absorbed by the Earth and thereby cooling the planet. 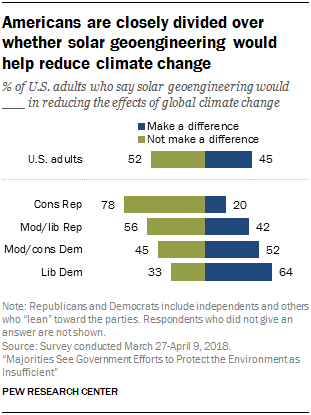 The Pew Research Center survey asked Americans whether they think solar geoengineering would make a difference in reducing the effects of climate change and what effects they believe these techniques will have on the environment overall. In contrast to public views on other specific policy proposals, opinion is closely divided – 45% to 52% – over whether solar geoengineering would make a difference in reducing the effects of climate change. Opinion on this issue is closely aligned with political affiliation. About two-thirds of liberal Democrats (64%) say these techniques would make a difference, while a large majority of conservative Republicans (78%) think they would not. Some 45% of the public believes solar geoengineering would bring net harm to the environment, however. Three-in-ten U.S. adults think these techniques would bring net benefits to the environment and 22% say they would have little effect on the environment. Compared with other climate and energy issues, there are relatively modest political differences in views about solar geoengineering’s impact on the environment. Generational differences emerge on some energy and climate issues but such differences occur primarily among Republicans, not Democrats. Republican Millennials are less inclined than their elders in the GOP to support increased use of fossil fuel energy sources through such methods as offshore drilling, hydraulic fracturing and coal mining. For example, 44% of Millennial Republicans support the increased use of offshore drilling, compared with 75% of Republicans in the Baby Boomer and older generations. Millennials in the GOP are more likely than their elders to say the Earth is warming due to human activity, consistent with a 2017 Pew Research Center survey that used somewhat different question wording. This group is also more likely than older generations in the GOP to perceive at least some effects of climate change in the communities where they live. However, Republicans across all generations are largely in agreement over the consequences of policies aimed at reducing climate change. For example, roughly 44% of Republicans say policies aimed at reducing the effects of climate change will make no difference for the environment and around a quarter believe such policies do more harm than good. Among Democrats, there are no more than modest differences by generation on beliefs about these climate and energy issues. Regardless of people’s political leanings, those who care a great deal about the issue of global climate change have strikingly different opinions than those who care less about this issue. Some 44% of Americans say they care a great deal about the issue of global climate change, one-third (33%) say they care “some” and 22% say they do not care much or at all. The segment that cares deeply about climate change is up slightly from 36% in 2016, the last time this question was asked. People who care deeply about the issue of climate change stand out for their near consensus that climate change is affecting the U.S. (96%) and that policy proposals such as restrictions on carbon emissions from power plants (95%), tougher fuel-efficiency standards for cars (90%) and corporate tax incentives to lower carbon emissions from businesses (90%) can make a difference in reducing climate change. These patterns are consistent with analysis of a 2016 Pew Research Center survey.